"It's a bird! It's a plane! It's Siegel and Shuster!" 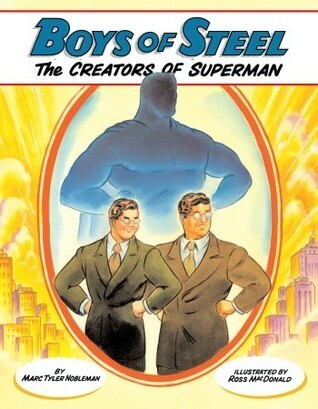 When two depression-era teenagers, Joe Shuster and Jerry Siegel, weren't reading about heroes like Tarzan and Flash Gordon, they were dreaming of creating their own superheroes. Too shy to interact with those in the real world, the two friends immersed themselves into their writing and drawing. While everybody else ignored him, Jerry imagined he had something special going for him. Jerry imagined a hero with the combined strength of all of the strongman he had ever heard of. One with superhuman abilities and an alter ego much like himself. He shared his idea with Joe who drew the pictures Jerry imagined. Thus the Man of Steel, Superman, was born in Cleveland, not Krypton. Labels: boys of steel book review, marc tyler nobleman book review. We LOVE Superman in my house! This looks like a great read that goes in a different direction. I love a good backstory. I think it adds a lot of richness and depth to whatever you're reading about--my boys will love this! My boys love superheroes so I am sure this would be a hit.